Ascension was a big deal for Syfy. It was the vanguard of their stated goals to return to the business of crafting serious science fiction, rather than focusing on paranormal “reality” shows and lighter-hearted fare such as Eureka and Warehouse 13. Well, now we’ve seen all three nights of the epic mini-series. Was it worth the wait? Did it maintain the excitement we’ve built up for future Syfy productions such as The Expanse and Childhood’s End? Yes and no. 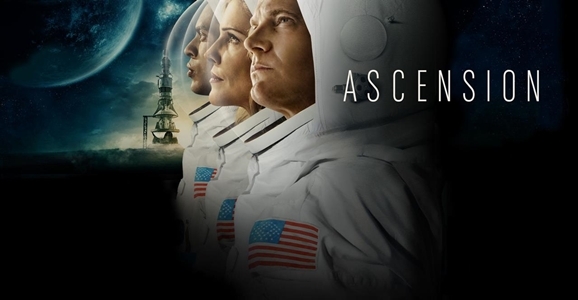 Over the course of its three-night run, Ascension enthralled, frustrated, jumped the shark, recovered its footing, and then slammed headfirst into an abrupt climax that simultaneously has us eager to see the story continued and also kind of miffed at how little actual closure it provided. If you haven’t finished watching Ascension yet, click away — If you haven’t finished watching Ascension yet, click away — there be spoilers here! One of the things everybody was so excited about when it came to Ascension — us at GFR included — was that it would be a return to science fiction actually set in outer space. That’s a field that’s been sorely neglected in the years since Battlestar Galactica, Firefly, and Farscape departed the airwaves. The notion of a murder on a so-called “generation ship,” halfway through it’s 100-year journey to Proxima Centauri, was a compelling one, and for the most part, that mystery and its resolutions were well handled in Ascension, wrapped in intriguing speculations about the sort of society that might evolve on such a voyage. But then we reached the end of Ascension’s first night, and the revelation that it was all a ruse — an incredibly elaborate, Truman Show-style experiment that has hundreds of people living and dying inside a mock starship, oblivious to the fact that they were being closely watched by their puppetmasters, and that they were probably no more than a few miles away from the nearest Starbucks. That twist no doubt hit some viewers with all the impact of Stokes hitting the mat. My own boss here at GFR was furious about it and said it had ruined the show for him. On the other hand, I was reserving judgment until I saw how the rest of the mini-series played out, and not just because I’d correctly predicted the twist a month or so back, based solely on the trailers. (If there mission was “not what it seemed to be,” that mission being a ruse of some sort seemed like the most obvious possibility.) If that twist had been held back till the end of the mini-series, I would have been right alongside the torch-and-pitchfork contingent. As a climactic, Shyamalan-style twist, it was far too obvious and too cliched to hang the entirety of the story on. But they didn’t hold it back, they planted it up front, which begged the question: where were they going with this? That was the question that everything hung upon. The biggest compliment I can pay Ascension is that I didn’t see the eventual reveal coming at all. We soon learned that Ascension, rather than being merely a long-term simulation of space travel, was instead a eugenics program designed to spur “punctuated evolution” and create…well, whatever it is that Christa (Ellie O’Brien) is. The more time Ascension spent on the whole “will they learn the truth or not?” plot thread, not to mention the rough politics of the top-secret Ascension program itself, the more convinced I became that the mini-series would live or die on its final moments, and the presumed revelation of Christa’s powers and true nature. As it looked like she was just headed down the “Dark Phoenix” road we’ve seen a thousand times, I was more and more dismayed. But then we got that shot. The one of Gault (Brandon P. Bell) looking around in amazement to find himself on an alien world…and at that point, I was all in. All that talk about Ascension being “a lifeboat for humanity” suddenly made a lot more sense. That I didn’t see coming. That I wanted to dig into. I want to see the show where mankind has unlocked a gateway to the stars, perhaps not even entirely understanding how they did so, and what happens now that they’ve got it. So Ascension left me wanting more, absolutely, but it also left me kind of pissed off. The early ratings were good for Syfy, if not an out-of-the-park home run. But there’s still a possibility that what we’ve seen of Ascension’s story is all we ever will, and if that proves to be the case, it’s a terrible ending, in execution at least. Like I said, the revelation about just what Christa can do, and what the ultimate goals of the Ascension scientists were, that had me hooked. But even if Ascension was ideally going to serve as a backdoor pilot for a future series, that series is by no means guaranteed, and as an ending to a standalone mini-series, Ascension’s final moments felt incredibly, inexplicably abrupt. This didn’t feel like the end of a three-night event series. It felt like there should be a fourth night of the series to explore all the information we’d just been given. Hell, it even felt like we had at least one more act coming after the commercial break. But no such luck. For all its good qualities, Ascension left audiences in the same boat as a moviegoer killing time while waiting for the theater employees to fix the broken projector. On the one hand, I really want to see what comes next in this story I’ve become invested in…but on the other hand, I do wonder if, by the time they get around to telling it, I’ll still care at all. I had problems with some of artistic latitudes that were taken with the show much like BSG. Too much soap opera/relationship drama. These sort of missions and the situation with BSG would be under military rule with no elected council or press. I am always disappointed with these type of shows. SYFY can do better. It left so many unanswered open ended questions. I was still thinking about the show the next day. Never once has a poor movie left me pondering it for even one day. I also liked that it was not easily predictable and that most characters were not clearly good or evil, just human. Quality show that left me wanting more. At least it wasn’t about a black hole. Too bad she didn’t teleport the whole building now that would have been cool. This is not Science Fiction people, it’s a Drama/Mystery. We as a people have lost touch with what real Sci-Fi is. Destination Moon, the Stargate Series and Firefly are examples of real Sci-Fi. And no, Alien was not Science Fiction, It was a Horror movie. Get with the program. Not a great start for a channel that wants to return to it’s roots. Agree with Mike. This is a horrible example science fiction.